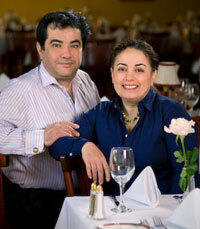 After 22 years, the Russia House Restaurant has transitioned to a new location just across the street. Nestled in quaint Old Town Historic Herndon Virginia the new venue is bright, sophisticated and cozy, it's decorated with Russian antiques, art work and stacking dolls. Russia House maintains its charm while delighting guests with innovative cuisine to create a unique dining experience. Classic crystal chandeliers are hanging from the ceiling, tables with white linens, beautiful plates and plenty of candlelight all bring both a fun and romantic vibe to the dining room. Russia House welcomes diners with open arms, feeding them Traditional Russian, French and Modern Fares. Drink, eat and be merry and understand what true Russian elaborate hospitality means. Russia House Restaurant opened in July of 1992 by Ali and Homerya Darugar, a family owned resturant, together they created an atmosphere of aristocratic dining with a classic cuisine and a warm feeling that you are dining at your grandmother's table. Homeyra moved from Russia with her grandparents to Switzerland, where she learned to cook in her grandmother's kitchen. She brought her great culinary talents here to the United States and created the exquisite menu and served as the head chef. 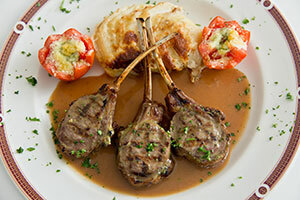 The amount of effort that the owners put into the culinary details is apparent from their ability to create a seemingly endless variety of tangy cream sauces, to the influence of Russian and French cuisine with some Modern Fare.